NFPA online training was created by experts. It allows you to learn at your own pace, anytime, in the location you desire and from the comfort of your laptop or PC. Online Training is cost effective, convenient and you earn valuable CEUs. Get started today. Select any of the training below to learn more or register. You can try one of the several available free demonstrations before you register. Also available from NFPA: Online state-approved continuing education. 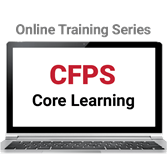 If you have any questions about NFPA's online training, see the FAQs. Up to date with the 2019 edition of NFPA 13, interactive online training introduces students to the basic principles of the components, application, design, installation, and use of automatic sprinkler systems. 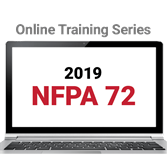 Get inside the 2019 edition of NFPA 72 through interactive online training. 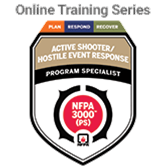 This online training teaches you how to prepare yourself, your employees, your organization or facility, and your community to effectively plan, respond and recover from active shooter and/or hostile events through integrated preparedness and response based on NFPA 3000™ (PS).